Paul Kostrzewa's Arcade Games Collection - Collected It! [Not my picture!] 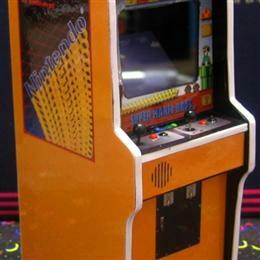 My Nintendo VS. cabinet - monitor, marquee, sideart, paint, bezel, PCB, transformer, light and wiring all original. According to labels it was at one time Hogan's Alley but is now VS. Baseball. No control panel so it's neber been tested. First on my list for restoration. My Centauri Vanguard cabinet. No monitor, no sideart. Wiring, control panel, transformer original. Was converted to Twin Cobra with PCB, bezel and marquee. The cabinet was painted black but the original woodgrain laminate is underneath. 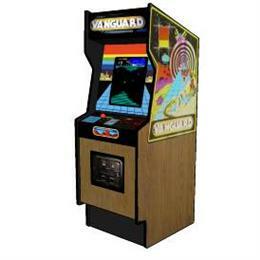 Control panel has extra holes drilled so will need replacing, needs a monitor and I'd like to restore the Vanguard sideart, bezel, and marquee but they're hard to find, even repros. Thsi will be my second, and much harder, restoration project.